Leading hot tub and swim spa distributor Aqua Warehouse Group will be aiming to propel its presence in the wet leisure market during the Hot Tub Living Expo by promoting a new swim spa model to retailers. The L.A Spas and Vita Spa distributor has been busy gearing up its publicity campaign for a new breed of swim spa with the introduction of the xStream Force Jet Propulsion System from Vita Spa, which will be showcased by Aqua Warehouse Group chief Richard Hart and his team in Hall 11 at the Birmingham NEC as part of the launch of the cutting-edge VL4 Swim Spa model. Coming in at 427cm x 228cm x 127cm, with a dry weight of 1,134KG and filled weight of 5,851KG; the VL4 incorporates three 3HP pumps and the new Jet Propulsion System from Vita Spa manufacturer MAAX Spas. Along with 19 Hydrotherapy Jets, four Turbo Stainless Steel Swim Jets and six Aurora Cascade Jets, the VL4 also has BlueMAAX Green Insulation, an LED illuminated Swimline, DuraMAAX Cabinetry and Wifi Connectivity. Richard Hart, who is among a small band of UK Pool & Spa Expo exhibitors who will continue their unbroken successive run of appearances at the NEC as part of the renamed Hot Tub Living Expo, will be on hand with his exhibition team to provide comprehensive details about the new VL4 and explain that it uses proprietary ‘Anti-Turbulence’ technology to boost and smooth out the swim stream for the ultimate swimming or exercise experience. In addition, it has a 30” wide swim stream and provides 50 per cent faster and more powerful swimming experience. 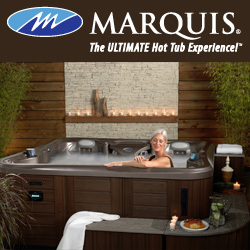 “This anti-turbulence technology was created to stop counter currents where the water tries to bounce back down the swim stream which causes waves and makes it difficult to stay in the ‘swim lane’,” said Richard Hart, who will also be promoting his thriving Aqua Spa Supplies division at the Hot Tub Living Expo. For further details about the VL4 and the many additional products and opportunities for L.A Spas and Vita Spas hot tub and swim spa dealers visit the new Aqua Warehouse Group exhibition area on Stand A33 promoting examples of models from the respective brands at the Hot Tub Living Expo, which will be open to trade visitors from 10am to 5pm on Monday, October 24; and 10am to 4pm on the second day of the exhibition on Tuesday. Aqua Warehouse Group will also be taking part in the Hot Tub Living Expo special VIP Evening that is scheduled to take place on Sunday, October 23, from 5pm to 8pm.